This entry was posted in Articles and tagged articles on February 28, 2014 by Tom Grundy. Anis Andriani, a 28-year-old helper from Ponorogo, Indonesia, was hospitalised in Pokfulam this week after her employer allegedly chopped off her finger with a knife. Anis says she had previously attempted to alert neighbours to her ill-treatment. 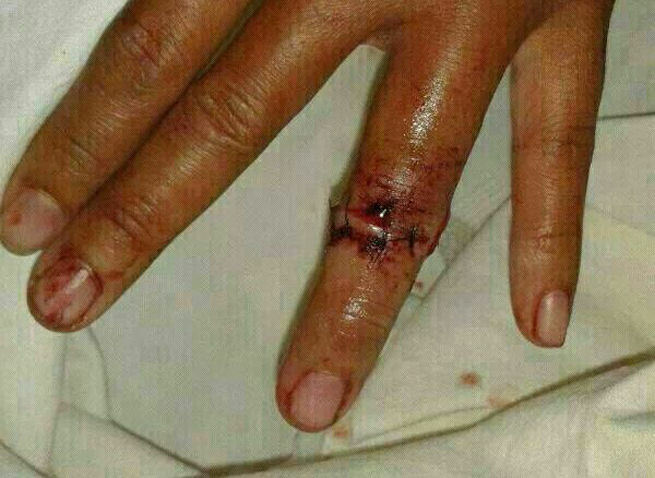 When she was unable to understand her employer, Anis says she severed the tip of her finder with a knife on a chopping board. It is the latest in a spate of torture incidents. Yet as Anis was being treated in hospital, the government promised that the two-week rule and live-in rule – which enable such mistreatment – are here to stay. This entry was posted in Events Press Release and tagged events Press Release on February 26, 2014 by Tom Grundy. The HK govt’s Legislative Council Panel on Manpower will hold a committee meeting on Thursday to discuss: “Policies relating to foreign domestic helpers and regulation of employment agencies” on 27th Feb, 14:30-17:30, Conference Room 2 of LegCo complex. Agenda. 2014 – ‘HK Helpers Campaign LegCo Submission‘, HK Helpers Campaign. 2014 – ‘Rob Connelly, Barrister-at-law & HK Helpers Campaign Legal Advisor LegCo Submission‘, Rob Connelly. Over 50 groups will attend this meeting, highlighting the importance of this issue for the people of Hong Kong. 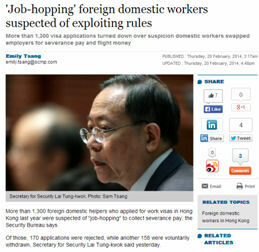 A number of these groups such as Amnesty International, Helpers for Domestic Helpers (HDH), the Civic Party and others are supportive of an improvement in rules for domestic workers, while others are not, such as the Liberal Party and the Hong Kong Employment Agencies Association Ltd. This entry was posted in Articles and tagged articles on February 24, 2014 by Tom Grundy. What would you think of a law which penalised you for changing your employer? What if you had paid the majority of the costs of your recruitment to an employment agency and were now being told that to resign would be unfair to your employer? Why do we countenance such discriminatory administrative policies towards migrant domestic workers, or Foreign Domestic Helpers, as they are known to the Hong Kong Government? 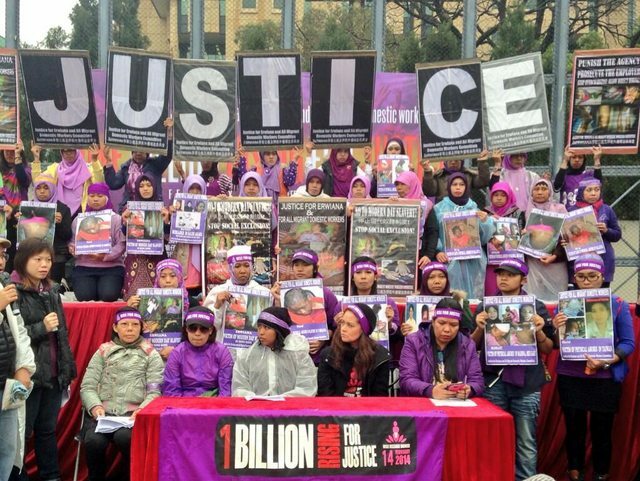 Once again, the job-hopping myth has been trotted out to justify the discriminatory and punitive immigration policies towards migrant domestic workers (“‘Job-hopping’ helpers exploit rules for cash” – 20 February 2014). It’s time to look at the facts. Contrary to the statement of the Security Bureau in the article, workers who terminate their employment contracts prematurely are not entitled to severance pay under the Employment Ordinance. They will only receive any outstanding salary for the period worked and return passage to their home country, as a ticket or cash in lieu, at the discretion of the employer. A worker who does not have grounds to terminate the contract summarily has to give one month’s notice or pay one month’s wages in lieu of notice to the employer. After terminating her contract, the worker has 14 days to find a new employer, at the end of which she has to leave Hong Kong, whether or not a new employer has been found. She will suffer loss of income for four to six weeks while waiting for the new visa, or even longer if she did not find an employer and has to register again with an agency in her home country. This entry was posted in Activism and tagged activism on February 24, 2014 by Tom Grundy. 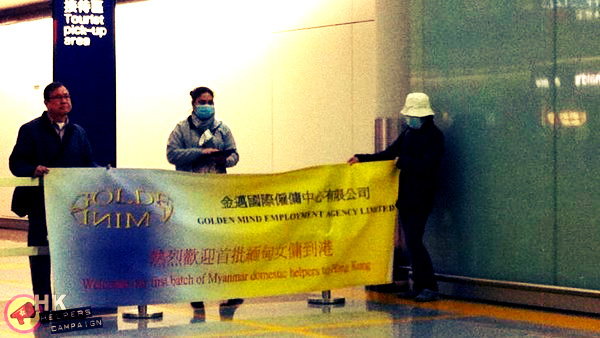 In the early hours of this morning, 19 new Burmese domestic helpers were greeted by Golden Mind Employment Agency at Hong Kong’s International Airport – the first wave of workers from Myanmar. A representative from HK Helpers Campaign went to meet the newcomers to distribute a concise list of helplines, support networks, advice and rights information in their language. 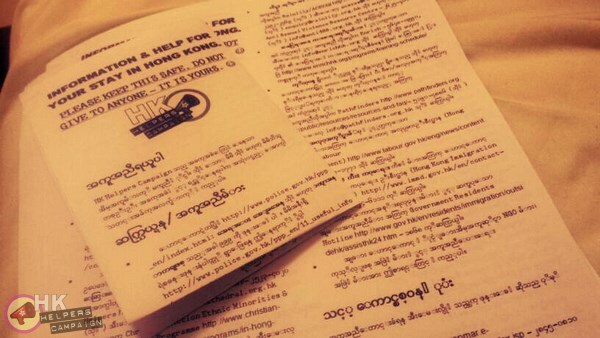 The campaign is not aware of any government agency or other NGO informing new helpers from Myanmar of their rights. People from Myanmar are arguably the most vulnerable people in Southeast Asia. The rules have not changed in Hong Kong and so they are at great risk of abuse. 58% of helpers in the city have been abused physically, verbally or sexually, according to a 2012 survey by Mission for Migrant Workers. Burmese helpers have limited Cantonese and English skills and are not internet-savvy due to years-long restrictions in their country. Additionally, there are no other Burmese helpers in Hong Kong for them to turn to for help. This entry was posted in Photography Protest Video and tagged Photography protest video on February 11, 2014 by Tom Grundy. Over 500 people braved the drizzle, filling Victoria park and demanding an abolition of discriminatory policies against helpers.